We've been jonesin' to get out on the trail for a while now. 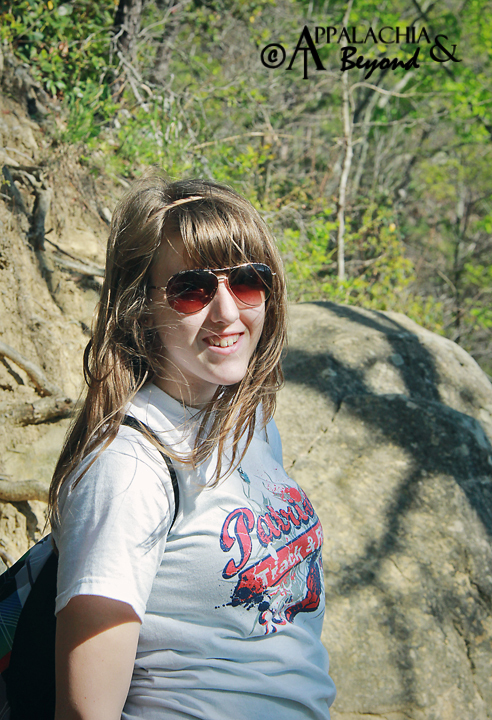 We hadn't been on any hikes since September of last year. Well I take that back, Robin did let me out on the Hiker Release Program back in November. 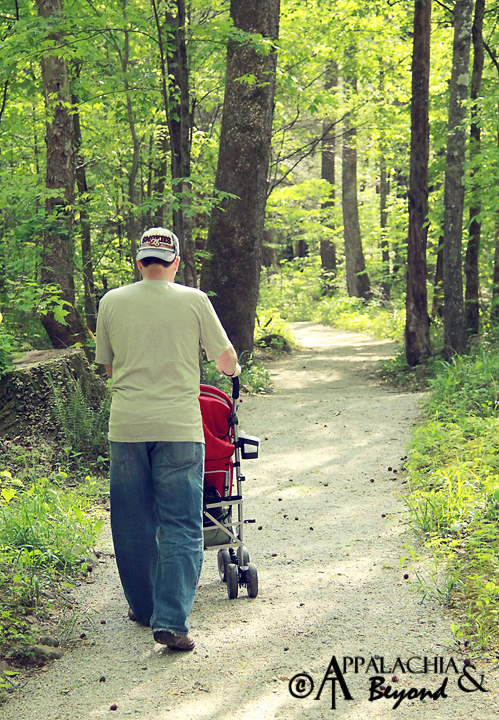 Granted we've been on the Songbird Trail at Norris Dam State Park a couple of times and up to the Pinnacle Overlook at Cumberland Gap NHP after our little Bug was born but those were more just strolls along the path and not what we consider "real hikes". This all changed last weekend when we decided we were going to get out on the trail even if it killed us. We had originally planned on just doing one hike this weekend. However, we had a small dilemma. Dinah is at the discovery age (4 months old) and she's not keen on being in her car-seat stroller. So we had to find a stroller that would allow her to sit up and see the world as it came at her. We found a good stroller and decided that instead of hiking on Saturday, we would just go to a park and walk around to test out the stroller and see how "Bug" did. We decided to head to Frozen Head State Park for testing. Once we arrived though our plan for just walking around apparently escaped our minds as we found ourselves heading down the Flat Fork Nature Trail. We took turns pushing Dinah in her stroller and watching how she reacted. (We being Robin, Tim, and Sis). Bug was loving it, making all the silly baby noises she makes when she's in a good mood. We took our time, not in any big hurry, but before we knew it we were parallel with the shelter at the trailhead for the Interpretive Loop and many other trails. We decided to cross the street and really push the limits, leaving the crushed gravel footpath for a little more rugged dirt path and headed for the Interpretive Loop Trail as we knew it was short and really not all that rugged. Yes, it is a wooded path and yes there are rocks, roots, and footbridges. A little ways into the trail, we stopped at one of the benches for small break as it was time for Dinah to eat. We enjoyed watching the stream flow by and really soaked in our surroundings. After break time we continued onward as there was still plenty of day light left. We finally hit a spot in the trail were it got real bumpy and instead of pushing Bug through that, Robin carried her through while I handled to stroller. When we returned to the trailhead, bug was ready to eat a little more as she was getting a bit fussy (it was time for a nap, and a bit of topping off usually helps). 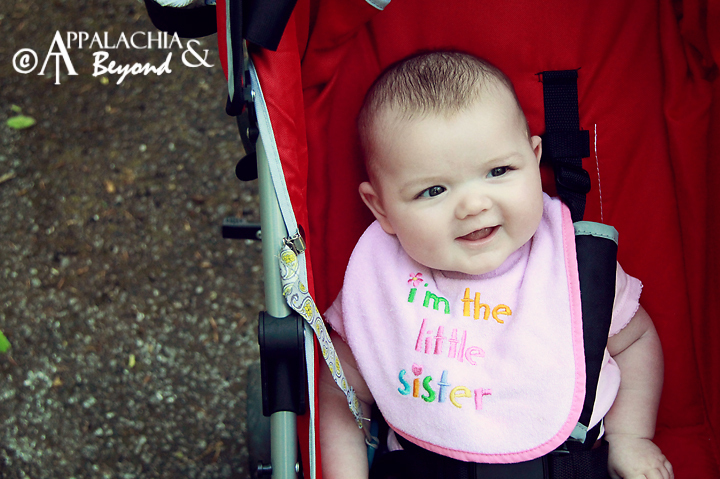 We put her back in the stroller and headed back to the car on the road. Dinah was asleep in the stroller in no time. We got back to the car packed everyone and everything in and headed for home. It was a successful test. 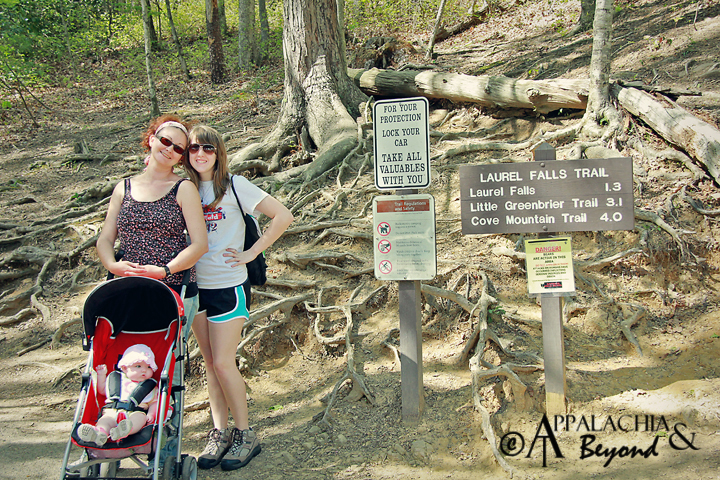 We decided we'd head to the Great Smoky Mountains National Park and hike the Laurel Falls Trail. This is a great trail for beginning hikers as it's a paved trail. Well it's a roughly paved trail. I'd guess it was paved about 20 years ago or so and let's just say there's been plenty of wear and tear. 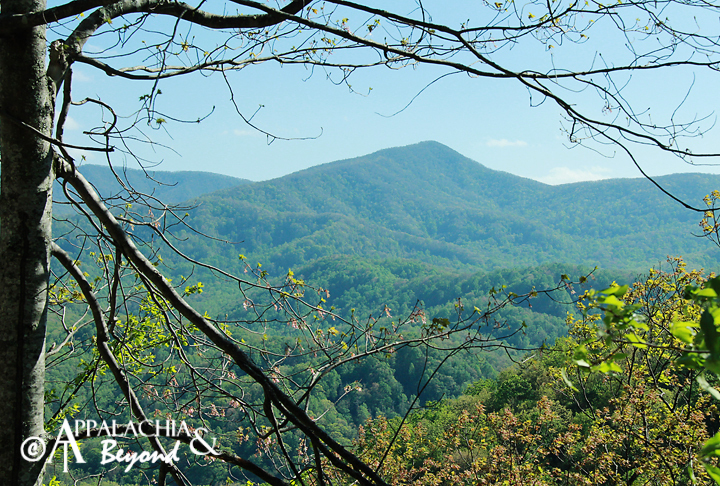 The trail is a total round trip of 2.5+ miles with about 450ft.+ elevation gain. The reward is the beautiful 80ft. 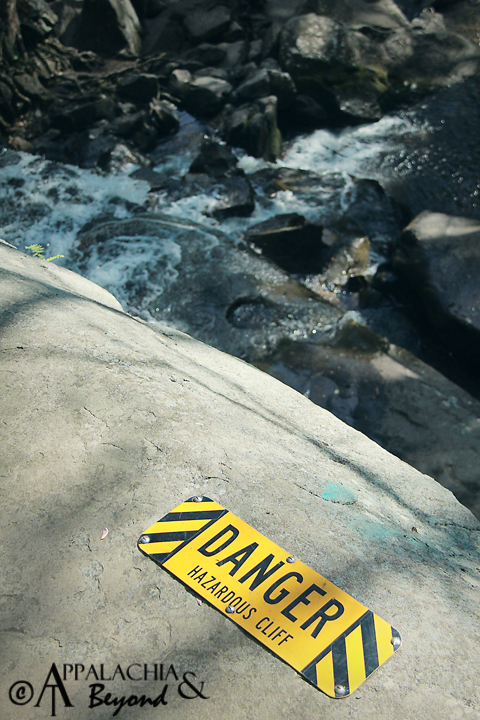 Laurel Falls. 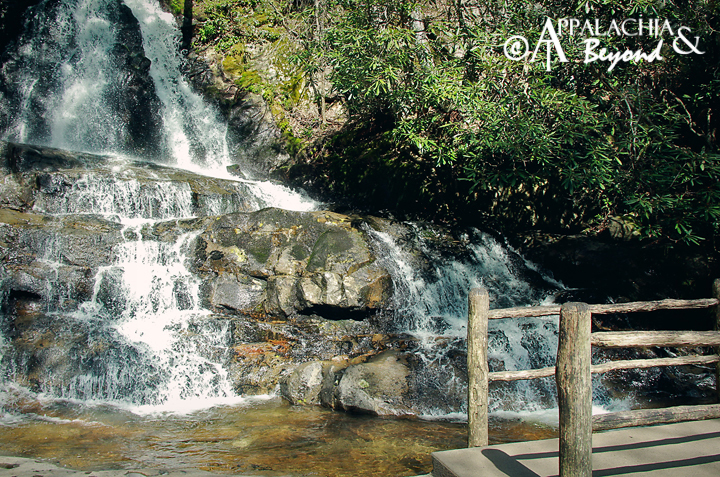 The Laurel Falls Trails continues on past the waterfall but at that point it becomes rugged and is no longer paved. We had no plans on going farther than the waterfall. At the trailhead there is a small pamphlet kiosk where for $0.50 you can get a self guided nature trail brochure for your hike up Laurel Falls. There are 11 points of interest from the trail to the falls to learn about. Along the way are plenty of wildflowers to look at including Flame Azalea. We even saw a few different butterflies and a blue tail skink. The views of the mountains especially Blanket Mountain from the trail are simply breathtaking. The last time I had been to Laurel Falls was 12 years ago for kiddo #1's third birthday. It's pretty much as I remembered it. Even for as rugged as the path was, Bug in her stroller was very content with the trip. She even enjoyed looking at the waterfall and feeling the breeze that was produced. When presented with the opportunity to dip her feet in the water, she splashed and kicked for a moment and then realized how cold the water was and shrieked. Currently she loves her warm water baths and isn't sure what to make of cold water. I guess we'll see how that changes when she's 2 or 3. We sat at the falls for a good bit enjoying the breeze, nervously watching other people let their kids get entirely too close to the ledge, and talking with a couple different people while up there. I may not have mentioned it, but Laurel Falls Trail is a very popular trail considering it's paved and all the typical tourists and non-hikers make the trip up. After cooling down and re-hydrating, we made the trip back down in no time flat. Robin had to carry Bug for a little ways down at first just as she had to carry her up towards the end of the trail as it was way too bumpy. At one point, we passed a group of guys hiking up with beers in their hands asking how much further. After informing them they were about halfway one of the guys says to the rest of the group something along the lines of, "We're never going to stop at the Moonshine shop again before hiking up a mountain!". I think that is probably the funniest thing I've ever heard on the trail. Ever! We enjoyed our hike down spotting Flame Azalea all around and taking in the views of the mountains. We exchanged pleasantries with everyone we encountered going up in the opposite direction. Robin and I also enjoyed conversation and the company of each other as always, and before we made it to the bottom bug was sound asleep. I believe even Kiddo enjoyed herself as well. Driving home, Robin suggested stopping at Popeye's for supper. That put smiles on all our faces. 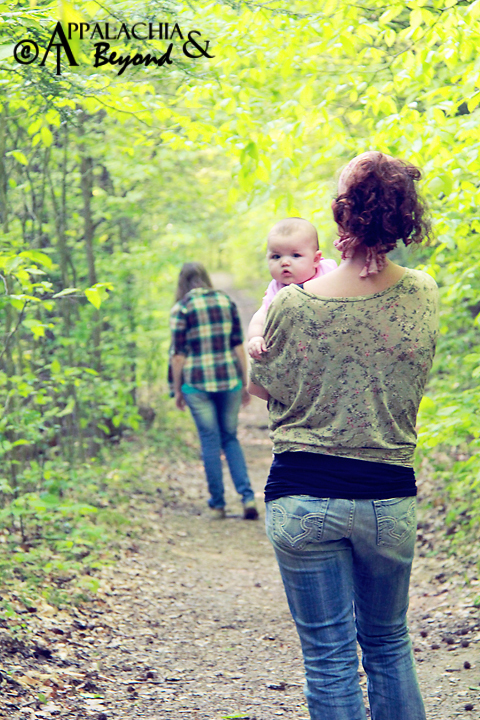 Stroller Stars (Ease of use on trail): 4 out of 5 on nature trail, 3 out of 5 on interpretive loop. 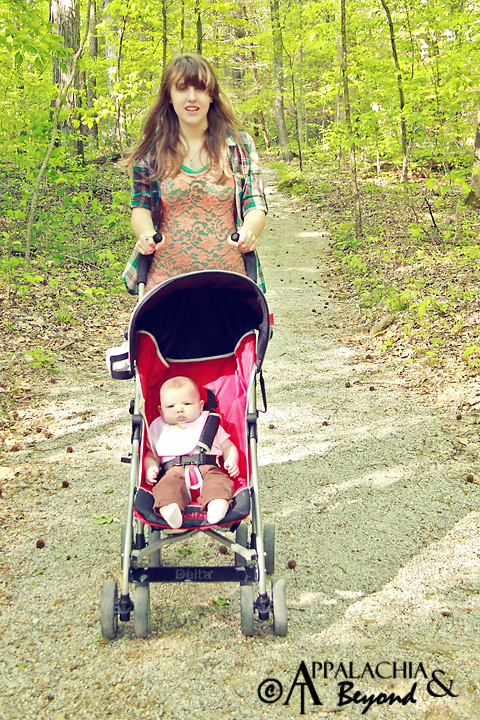 Stroller Stars (Ease of use on trail): 3 out of 5.